HONG KONG, China (CNN) -- In the world of business -- where book titles like "Only the Paranoid Survive" thrive -- successful executives hope for the best but plan for the worst. 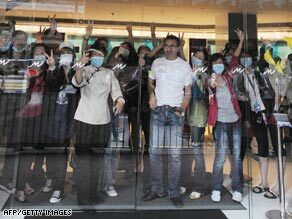 Quarantined guests at Hong Kong's Metropark hotel wave to world press. But no amount of planning could have prevented the bad luck that befell the Metropark hotel group last week. The Metropark Hotel in Wanchai was shut down when a guest -- having recently arrived from his native Mexico -- fell ill with the city's first reported case of H1N1. City health officials, chastened by the experience of SARS, quickly quarantined the hotel and its nearly 300 guests and employees. The city is trying to avoid a repeat of what happened in 2003, when a doctor from nearby Guangzhou came to the Hong Kong to attend a wedding. During his one-night stay the doctor, who had been treating patients with an unusual respiratory ailment, fell ill himself. He infected at least 10 other guests, according to Hong Kong University research. Those guests then spread SARS to the rest of world. That hotel? The Metropark Hotel in Kowloon. Formerly known as the Metropole, that hotel was ground zero for the first reported case of SARS in Hong Kong. Both hotels are among four properties owned in the city by a subsidiary of China Travel International, which operates 50 hotels in China. With the world press corps parked outside taking photographs of bored, confined customers, the hotel chain is realistic about its potential impact on business. "Revenue loss and image damage is a concern," said Benny Ng, an operations manager for the chain. "When an incident like this happens, obviously, it will have a little impact on the business. "With this and the incident in 2003, (the situation) was not caused by the hotel, and has nothing to do with the hygiene or the facilities of the property," he said. "What we can do is try our best to make our guests, and the staff, comfortable to help them to overcome the quarantine and difficult times in forthcoming days." The markets seem to have shrugged off the flu scare -- shares of Hong Kong-listed China Travel International rose by nearly 6 percent in trading Monday. Still, what are the odds of the city's first reported outbreak of two separate new illnesses being found at the same small hotel chain? To calculate that, you would need to consider a variety of factors akin to the computation of lightning striking the same place twice. "It does seem like a bit of a freak occurrence," said Dr. Alan D Miller, an expert on economics and game theory at the University of Haifa. "But freak occurrences do happen."